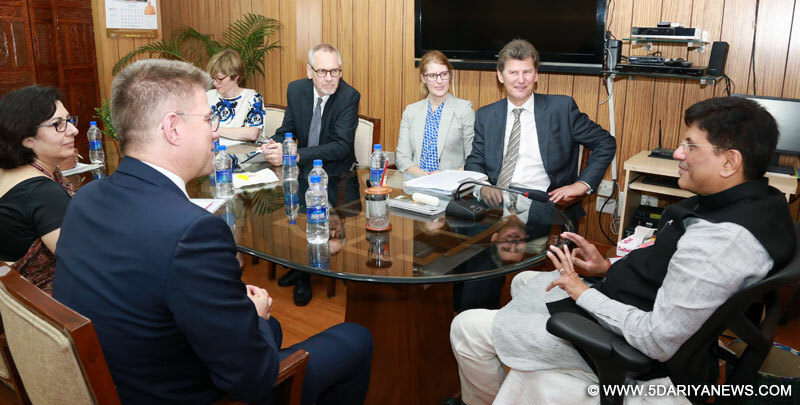 The Minister for Foreign Affairs of Iceland, Mr. Gunnar Bragi Sveinsson meeting the Minister of State (Independent Charge) for Power, Coal and New and Renewable Energy, Shri Piyush Goyal, in New Delhi on April 05, 2016. Charging the Western nations with adopting double standards in their approach to climate change, Indian Power Minister Piyush Goyal on Tuesday urged them to "show some magnanimity" and keep renewable energy out of the World Trade Organisation (WTO) framework. "My concern is that there is a lot of gap in what is being said by the West and what is being delivered. There is no denying for the fact that for last 150 years, the West has enjoyed low-cost fossil fuels and developed their economies," Goyal, who also holds the renewable energy portfolio, said at an International Finance Corporation (IFC) event here. "I appealed to the US, when negotiations were going on, that we can keep renewable energy out of the WTO framework. After all we decided in Singapore that no country will put import duties on renewable energy, on solar products. "I don't see any reason why the West could not show some magnanimity and keep renewables out of the WTO framework, particularly when Indian manufacturers had such a large heart and had withdrawn the anti-dumping request, which had been ruled in their favour and could have imposed huge anti-dumping duties on the US," he added.Noting that most of the western world survived on coal, Goyal said coal consumption in the US, in per capita terms, is as much as India consumes in 2016. "So, I think the reality is that West waited till it found cheaper sources of energy. Till shale gas become affordable, it kept talking about the inconvenient truth. "So, it is not as if the inconvenient truth came out very late. We knew this truth 50 years ago also. New South Wales University started developing solar technologies 45 years ago," he added.